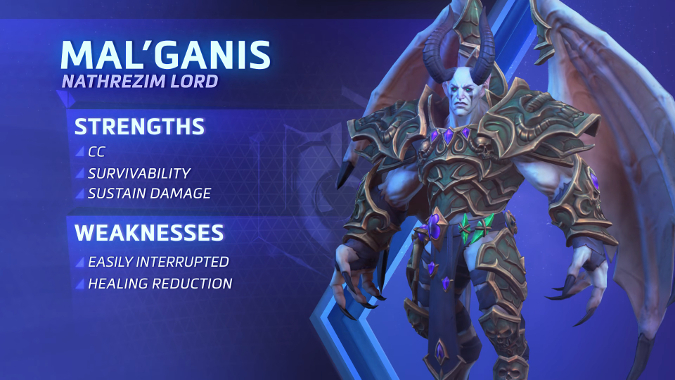 The dreadlord Mal’Ganis will be the next Blizzard character to enter Heroes of the Storm, coming soon to a PTR near you. Though Mal’Ganis is known for his shadowy manipulations in the Warcraft mythos — he’s the one who lured Arthas into becoming the Lich King, and guided the Scarlet Crusade down an even darker path — the dreadlord will be a melee warrior in Heroes. His recently release Hero Spotlight shows rather fast-paced gameplay, with Mal’Ganis unleashing flurries of melee strikes upon his opponents. Overall, Mal’Ganis seems to have a great kit for being a tank. His Vampiric Touch trait heals him for a portion of all damage dealt, which will sustain him in a fight — and given his damaging abilities have an area effect, his trait could translate to a lot of healing in a close quarters team fight. Necrotic Embrace also grants him 25 armor, which will further help his survivability in that situation. However, tanks have been a tough issue in Heroes of the Storm. Tanks need more than the ability to sustain themselves; Blaze and Yrel both have great sustain, and both characters were intended to be main tanks. In practice, though, both heroes have been relegated to solo lane bruiser status. Tanks also need to be able to do things other than survive. They need to be able to force an engagement with the enemy, or peel for allies. Yrel can’t do those things particularly well due to the wind up on her abilities, and Mal’Ganis seems to face similar issues. While Night Rush can apply a Sleep effect to his enemies, the ability has a cast time, which will make it difficult to use while on the front line. The range is also more limited than, for example, Diablo’s Shadow Charge. Though Mal’Ganis does have crowd control abilities, he might not have the same mastery over the battlefield expected of main tanks. Like Yrel and Blaze before him, Mal’Ganis might find himself incapable of properly tanking, and instead end up dominating in the solo lane. His Heroic Abilities both seem powerful, but exacerbate this concern. Dark Conversion allows Mal’Ganis to swap his health with an opponent’s health, which is incredibly powerful in theory — but it also has a channel time. If Mal’Ganis is on the front line trying to soak up damage and keep the enemy team busy, it seems likely they’ll be saving their crowd control specifically to prevent him from getting an easy heal. His weakness of being easily interrupted isn’t something you want in a tank. His other Heroic Ability, Carrion Swarm, turns him into an invulnerable flurry of bats. Any damage dealt by the Carrion Swarm heals Mal’Ganis immensely, but it also effectively removes him from the battlefield for that period of time. Johanna’s Blessed Shield ability is viewed as more viable than Falling Sword because of the same issue — Falling Sword removes Johanna from the battlefield for its duration. Your tank disappearing isn’t something you want, either. Much of this is speculation, however. Mal’Ganis isn’t actually playable yet, though he’ll be on the PTR soon. It’s entirely possible his kit will enable him to be a team’s tank just fine. Blaze and Yrel have simply left players skeptical. They’re both heroes that were supposed to be tank-viable aren’t often used as tanks, and ended up being bruisers who defined how the solo lane is played, instead.